When Circuit City went under in 2009, Best Buy seemed like the electronics superstore victor. But the same forces that hammered Circuit City are hurting it as well. The company has announced plans to close 50 "big box" stores this year and eliminate 400 jobs as part of a new transformation strategy to improve operating performance. The giant consumer electronics retailer has seen sales erode as an increasing number of customers use its stores as a "showroom" while turning to lower-priced e-tailers for their actual purchases. The fact that music, movies, books, and other media are now being delivered directly to end users over the Internet hasn't helped matters either. The company will make $800 million in cost reductions by fiscal 2015, including some $250 million in the next fiscal year. The store closures would reduce store square footage by 20% and pave the way for new so-called “Connected Stores” that will focus on selling cell phones, tablets and e-readers, as well as activating video, broadband, and other service plans not offered by Amazon and Wal-Mart. 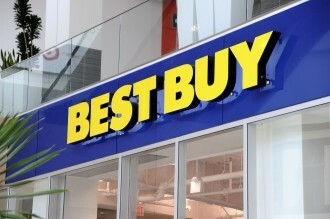 Best Buy plans to remodel several key stores following this format and will open 100 of these mobile-only stores in fiscal 2013. The shift to smaller and more focused retail stores will help the company "provide a better shopping environment for customers across multiple channels while increasing points of presence," according to Best Buy CEO Brian Dunn. They'll also increase their focus on service with things like loyalty programs, price matching, free shipping for some items, and offering offer no-hassle returns. Best Buy today reported a fiscal fourth-quarter net loss of $1.7 billion, or $4.89 a share, on revenue of $16.63 billion, up 3% from a year ago. However, that loss includes charges related to its decision to buy out U.K.-based Carphone Warhouse’s stake in a joint mobile-store venture for $2.6 billion. Excluding those charges, Best Buy actually earned $2.47 per share, a 25% increase from a year ago.